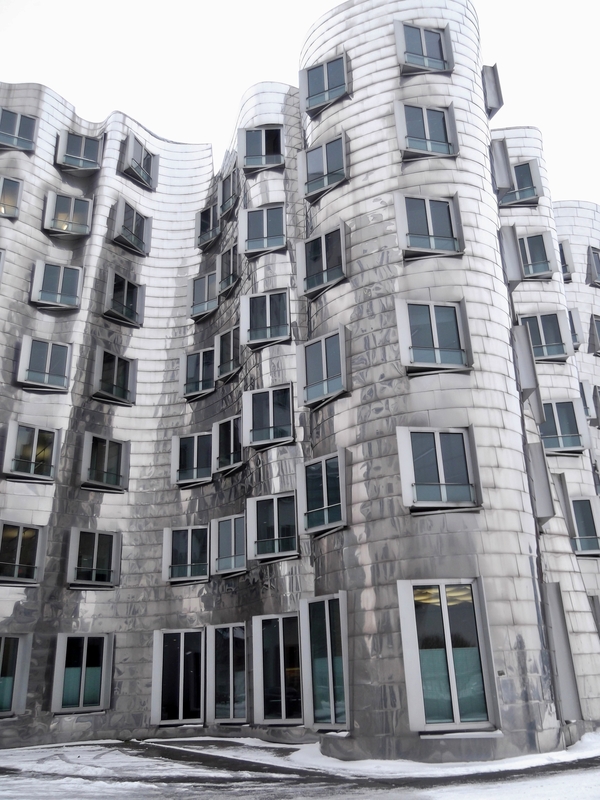 When I started looking into Frank O. Gehry’s architecture, my first impression was that it’s like Friedensreich Hundertwasser without dazzling colors and turf covered roof. And it turned out, my guess wasn’t that bad. Frank Owen Gehry is a contemporary Canadian-American architect who is based in Los Angeles. His buildings are world renowned, with his most famous being the Guggenheim Museum in Bilbao, Spain (1997). 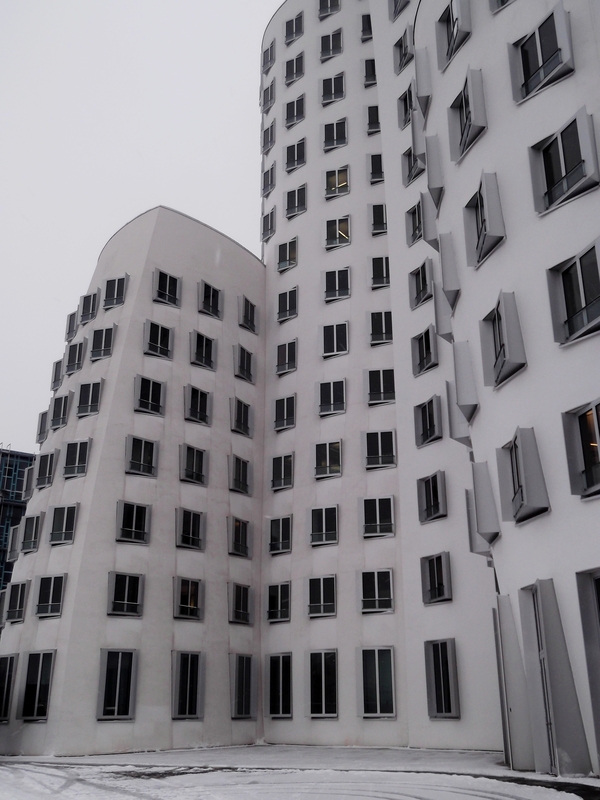 Gehry designed 3 neighboring buildings for the so-called Media Harbor (Medienhafen), which is part of the redeveloped port of Düsseldorf. The buildings were completed in 1999 and are home to offices and gastronomy. Each building has a different facade siding: the outer two in white plaster and red brick, the middle building in stainless steel, whose shiny cladding is meant to reflect the other ones. All three buildings curve and lean. In the picture above and below you see the middle building with its gleaming facade. Unfortunately, I don’t have a photograph of the one with the brick cladding. But you can easily find pictures of it on the internet. 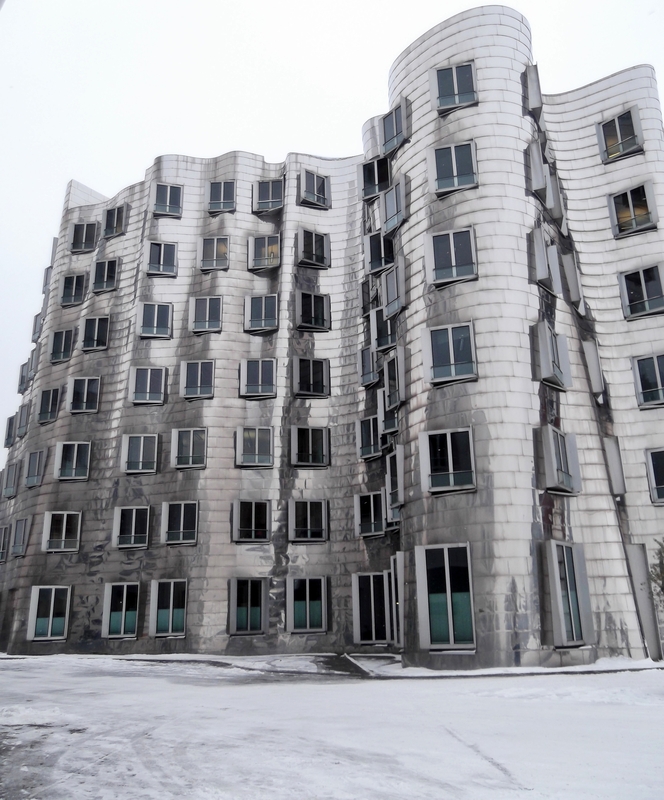 I’m not an expert on architectural theory, but I will try to say some words about Gehry’s architecture. First of all, if you take a look at his designed buildings all over the world, you easily get the impression that Gehry prefers round shapes and metallic exteriors. The latter is often explained with the fact that his grandfather owned a hardware store, and little Frank used to play with the materials. The forms and sidings of his buildings don’t seem to serve any specific function, but have mostly a great aesthetical value. In other words: they look beautiful! All this puts Gehry close to an architectural style called Deconstructivism, even though he is said to have rejected this classification. But I think that people who consider themselves as artists usually don’t like it to be subsumed under a movement or theory. They prefer their style to be unique. But when you compare Gehry’s works to other architecture that is characterized as deconstructivist, you’ll see a lot of similarities. form follows function, which means that the shape of a building should be primarily based upon his intended function or purpose. and truth to materials, which means that any material should be used where it is most appropriate and its nature should not be hidden. 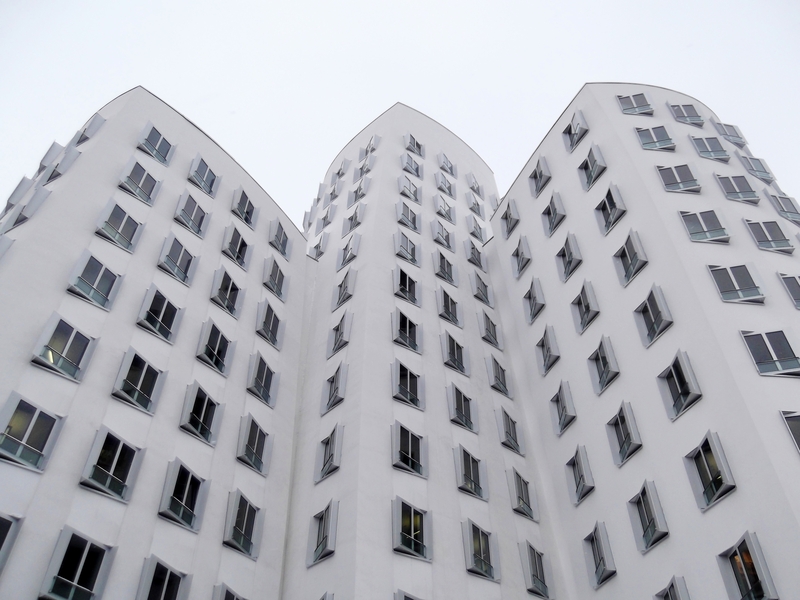 As a contemporary architectural style beginning approximately in the nineteen-eighties, Deconstructivism questioned those principles. In deconstructivist architecture, you will often see fragmented, non-linear shapes, and out-of-the-ordinary sidings. It reintroduces a more playful approach to architecture and enables a release from strict rules. And this brings us back to the above-mentioned Friedensreich Hundertwasser. He as well denied any affiliation to an architectural movement, but his works were equally an attack on the architectural status quo of his time. If you are interested, you’ll find a lot of additional information about the philosophical background and historical genesis of Deconstructivism on the internet. Impressive architecture! I really like the shapes, like waves. I am wondering the interior of the building..have you been inside? no, I didn’t have have time to try to go inside, I’ll try next time when I’m in Düsseldorf. It’s different but very interesting. I have done some research on the internet about deconstructivist architecture, and I must say, at least, it looks good. It’s in my neighbourhood! Love the buildings and the Medienhafen!